One day stocks are up, another day they are down. And sometimes they’re more down than others. As I write this, the S&P 500, a popular measure of stock market performance, is down almost 6 percent year-to-date. At one point in early February, it was down over 10 percent. As you can see from the 1 year chart below from Yahoo Finance, it ended 2015 essentially flat, so most of the losses have come since the beginning of this year. Plus, as the chart also shows, the market has been very volatile since the start of 2016, but there were some very volatile periods in 2015 as well (look at August to November). Kinda looks like a roller-coaster, doesn’t it? This reminds us of one very important fact: The financial markets, and therefore our investments that are tied to them, are volatile. Volatility is a fact of life. Why? Well, there are lots of possible explanations at any given time, and although it can all seem rather random or even capricious, it actually isn’t. Financial markets change because something has happened or some new economic news has come to light because something has changed. It has been said that the financial markets have taken all currently available information into account, and they really don’t change much until something new happens. There are different seasons and times for different things. Oil prices go up, oil prices come down; interest rates go up, interest rates go down; and, unfortunately, stocks go up and down too. The fact that our investments can lose money on any given day is the risk we take in exchange for a reasonable return. The greater the risk, the greater the potential return, which is a fundamental principle of investing. The recent volatility in the financial markets may be making you feel a little uneasy. So, what should you do? Well, that is actually a question needs to be answered BEFORE extreme market volatility or a major market downturn, not in the midst of it. What I mean by that is that you have (hopefully) already decided on a strategy, whether on your own or with the help of an advisor, and positioned your retirement portfolio in anticipation of such an event and are prepared to ride out the storm in the way you decided ahead of time. 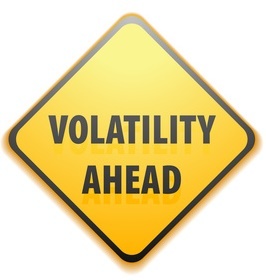 If you are in a panic because your account value has dropped 10 or 15 percent in the last couple of months, then you may not be as well positioned as you thought, at least in terms of the level of volatility and risk you are comfortable with. This comfort level (or lack thereof) is what is called your risk tolerance. One of the ways you can be prepared for these kinds of events is to make sure you are adequately diversified and that your investment mix fits your risk tolerance. The lower your risk tolerance, the more you should try to minimize volatility by diversifying your investments. We diversify so that we can can be patient, maintain self-control, and remain reasonably content during these inevitable market ups and downs. In other words, we don’t want all our eggs in one basket because that basket can fail. If you spread things out, your risk is the average of the risk of all your assets and overall volatility is hopefully reduced based on how uncorrelated (or unlike each other in their risk profile) your assets are. The context was different, but the principle of spreading risk to seven or eight investments (or perhaps more) is the biblical recommendation given by King Solomon (a pretty wise dude, by the way) to prevent an intolerably large loss from a single event. First of all, it is important to note that Dave is NOT saying that we should only invest in 4 mutual funds, with each fund being a different stock asset class. You could hold multiple funds in each of the four fund classes for additional diversification. On the other hand, you may want to keep things at a reasonable number in order to adhere to the “keep it simple” principle. One way to do that is to use low cost index funds from a company like Vanguard, Fidelity, or Schwab that hold hundreds if not thousands of stocks in them. The next thing to note is that Dave includes no fixed income (bond) investments in his recommendations. Now I don’t have a fundamental disagreement with Dave when he says that Bond Funds generally provide lower performance at only slightly reduced risk as the facts bear that out. Since its inception in 1986, Vanguard’s Total Bond Market Fund has returned an average of 6.18% in interest and capital gains. In contrast, the S&P 500 has returned an annualized 10.09% over the last 20 years, including dividends. That’s a pretty significant difference. But there’s more to the story, and it has to do with volatility. Although both can lose money, stocks tend to be more volatile than bonds. 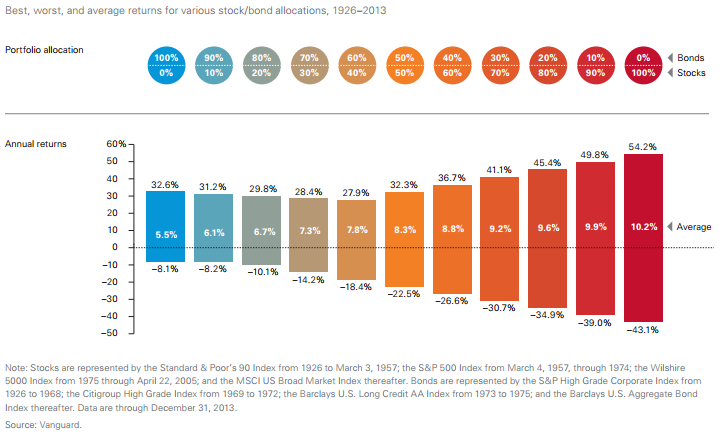 This chart from Vanguard shows the relationship between the two and demonstrates the impact of asset allocation on both returns and the variability of returns over time. According to Vanguard, the numbers just above the horizontal line are the average yearly returns since 1926 for various combinations of stocks and bonds. The vertical bars show the best and worst one-year returns for each combination. Obviously, this is a very long (90 year) period, but it does show why a very conservative investor with only 20% in stocks might have a very different outcome from an investor with 80% (6.7% versus 9.6%), but volatility was much greater as well. The vast majority of investors fall somewhere in between these two extremes of those who invest exclusively in stocks or bonds. So many people might want to take a balanced approach and divide their financial assets between stock and bond funds in a way that makes the best sense for them. And in most cases, age should be the first factor in determining that overall stock/bond allocation. One way to base it on age is simply hold your age in bonds. Thus, a 20-year-old could build a portfolio invested 80% in stocks and 20% in bonds, whereas a 70-year-old could hold a 30/70 stock/bond portfolio. Once you have decided on a basic age-based allocation, it can be adjusted based on your individual risk tolerance. If you’re 30 and have a high risk tolerance, you could back your bond allocation down from 30% to 20%, or perhaps even 10%. If you are more risk-averse, you could increase it to 40% or even higher. Just be aware that you will in all likelihood be sacrificing the potential for higher returns in exchange for less volatility. If you are okay with that – and many people are – then go for it. buy more and hope for even further declines so as to continue buying? (you may be crazy…just kidding, but you may have a”very high” risk tolerance). One thing to note: Young people tend to overestimate their risk tolerance as risk is an acquired taste. (Occasionally they actually underestimate it and invest too conservatively.) It is one thing for investors to look at a spreadsheet when they are 25 and decide that they can tolerate a 90/10 portfolio that might, under extraordinary circumstances, lose 40 percent of its value. It is something else entirely to calmly live through such an event, like the one that occurred in 2008. Older individuals, on the other hand, have lived through some bear markets so they know market declines usually end. Not infrequently, they lament having missed buying low when they were younger and resolve that next time, they will take that opportunity. Sorry, but here’s the hard reality: Stock returns much higher than the growth rate of major stock indices such as the Dow-Jones or the S&P 500 are extremely unlikely (and very risky). According to the economists, on average, you should probably plan on no more than about 5 to 7% per year for stock funds and 3 to 5% in bonds over the next 5 to 10 years unless you are one of those very rare and extremely knowledgeable and talented individuals who can personally invest very brilliantly. If someone tells you he/she will get you 20 or 30 percent in stocks or bonds, run away and please seek out alternatives. In a later article I’ll discuss details about allocating retirement funds across asset classes as well as investing in ways to accomplish risk-reduction. For now, just consider having your assets in several different types of investments; don’t get locked into just a single type (stocks, bonds, real estate, commodities, etc.) For most of my life, for my own 401K and IRA, I had a relatively simple (and now that I look back, perhaps too conservative) strategy: I invested mostly in Balanced Funds. Balanced Funds are simply funds that own both stocks and bonds. They are called balanced because they tend to keep the allocation between the two asset classes pretty steady, usually placing about 60% of their assets in stocks and 40% in bonds. For many people, this is an easy way to diversify. Here’s another shocker: No one really knows what the level of stocks or interest rates will be over the next few years, so by far the best approach is to use a diversified mix of stocks, bonds, real estate, and cash. (At the moment, as I am only a few years away from my full retirement age, I have about 30% of my portfolio in stocks and the rest in bonds, real estate, commodities, and cash.) Everything is in a self-directed IRA so I can most effectively manage the investments. Whether you hire a financial advisor or decide to do-it-yourself, I encourage you to minimize the number of your accounts and also to keep your assets diversified enough to live through most of the anomalies (another fancy word that just means unexpected ‘ups and downs’) that are certain to occur. If your advisor suggests that you can’t accomplish both, then I suggest you choose a different advisor. I also want to caution you to be wary of any financial guru/salesman/advisor/planner/advisor that claim to “know” with absolute certainty the one type of investment you should make (the one where they’ll get the biggest commissions). Otherwise you may need a brother or a friend who just happens to be a lawyer. And while I’m on this topic, please, please, please, do not put all of your 401K dollars in your employer’s stock. If you do, you are putting two big eggs – your income and your investments – in one basket. If that basket gets a big enough hole in it, ALL your financial security will fall out. So keep your investments diversified, make sure its lines up with your risk tolerance, and then adjust periodically as your situation changes. And remember not to have unrealistic expectations about what you can earn in any type of investment.